In preparation for flipping my 1948 Speed Liner I called on Mighty Mouse Mozelewski, aka my girlfriend “Patrice,” to help me lift the boat off its dolly and set it on the driveway. With the dolly thus freed of its burden, I set about modifying the dolly by adding two rows of 5’x2″x4″ boards running perpendicular to the bunks, mounted on 16″x2″x4″ braces running vertically. I positioned these rails approximately 48″ apart such that the points where the boat rested on them would be supported by frames. With everything solid, stable, and tight, I was ready to flip the boat upside down onto the modified dolly. Calling Mighty Mouse back to help again, we very carefully lifted the boat onto the dolly, tilted it up on one side, and then turned it over such that it was upside down. Then we adjusted its position until it was resting in the intended spot. I am going to strap the frames down to the rails so the boat doesn’t inadvertently shift and fall off the dolly while I am removing the bottom or sanding the frames. 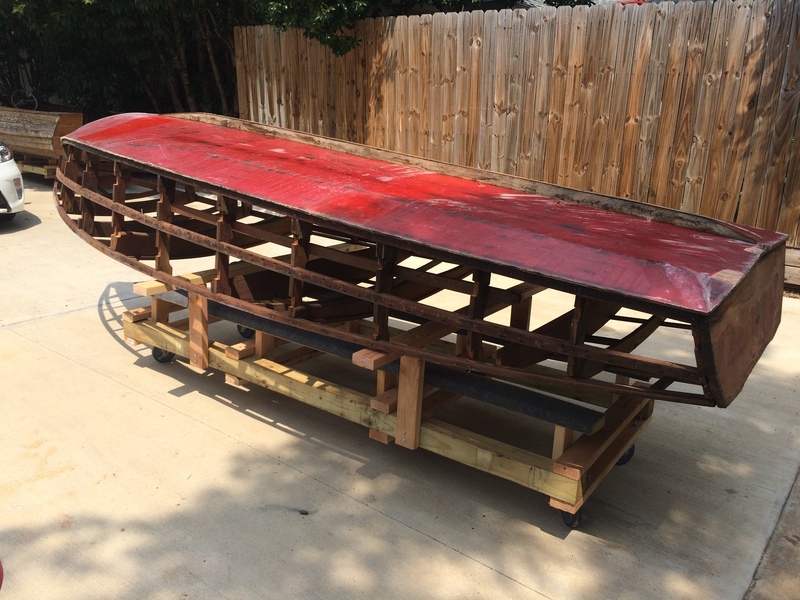 The hull bottom is made from 3/8″ thick plywood sheets screwed to the frames, covered with fiberglass, and painted red. Once I get the boat securely strapped down I will peel off all the fiberglass, expose the screw heads, remove the screws, and then pull off the plywood bottom. It will be important to not destroy the bottom parts as I will need them for templates when making the new bottom. Of course, before I mount the new bottom, there will be even more screw holes to fill with wooden match sticks. The boat’s keel has a metal strip mounted on it that runs from stem to stern, which will have to be removed and refinished. 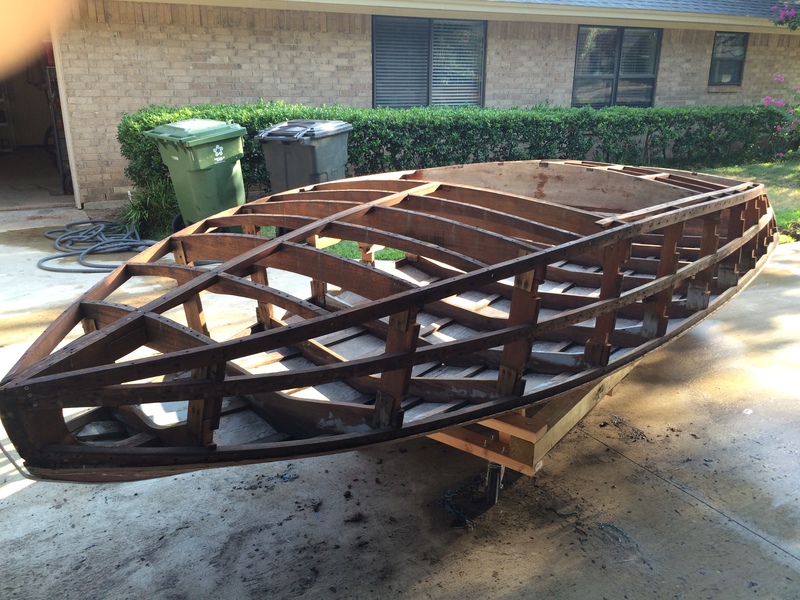 Once I get the hull bottom off all the frames will be completely exposed. I will sand them, seal them with Smith’s CPES, prime them with gray Interlux Pre-Kote Primer, and then paint them with black Interlux Brightside Polyurethane premium single part enamel. After that, it will be time for a new bottom. But, that’s a whole other story.